Not every wakeboard is made with kids in mind, but the Kwik Tech wakeboard brand is one company that chooses to focus on the desires and wants of young riders. The Kwik Tek Airhead Bonehead II Wakeboard is especially designed with children in mind. Because it has been created to be used by children and individuals of all ages, the construction is rooted in the use of durable materials which allow the wakeboard to take shock and trauma without damaging its functionality. The Airhead Bonehead is lightweight and 124cm long making it easy for younger riders to carry the board out into the water. For these reasons and more, children of all experience levels are sure to enjoy the ride that is possible with this board. One of the main reasons why the Kwik Tech wakeboards name is so popular in the children’s wakeboarding market is because their boards are made solely with the needs of children in mind. The range of fit for the Kwik Tek Airhead Bonehead II Wakeboard is from a men’s size eight and half shoe down to a child’s size thirteen. This range enables individuals of all ages to utilize the board and enjoy the ride they gain from it. The skull graphics are another plus for many as many children love the designs. However, this can also be a drawback for some children as customizability is not a feature and the skulls are not to everyone’s taste, especially those children with less of a desire for an edge. Further, because the design of the Kwik Tek Airhead Bonehead II Wakeboard is static and a child’s opinions and desires can change rapidly, it may not have the shelf life of other brand designs. The free-ride style, however, with the lightweight twin tips make the ride enjoyable if the design can be overlooked. Further, there is a great lace-up system for front entry. For safety and durability this Kwik Tech wakeboard comes with Bonehead power straps and two reinforced and structured fiberglass nylon fins included. 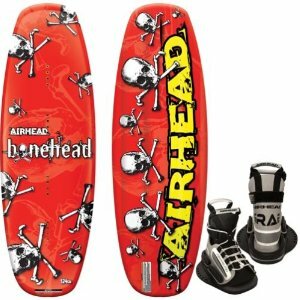 There are assuredly drawbacks of the Bonehead model of wakeboard, including the digital skull graphics included on the board. However, the positives outweigh the negatives and customer reviews attest to this aspect. Safety features and durable materials, as well as a relatively large range of uses make this member of the Kwik Tech wakeboards family a great option for many young to experienced riders alike. The Kwik Tek Airhead Bonehead II Wakeboard comes in at a price of only two-hundred dollars which makes it a great price option and not a family budget buster. This entry was posted in Reviews, Wakeboarding, Wakeboards and tagged Kwik Tek, Wakeboard, Wakeboards. Bookmark the permalink.